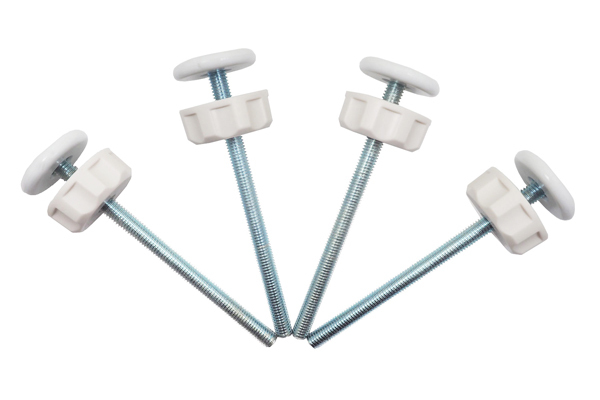 Some parents would rather avoid putting the screw and anchor holes in their drywall that comes with mounting baby gate hardware. If that sounds like it describes you, you may be interested in a pressure mounted baby gate instead. 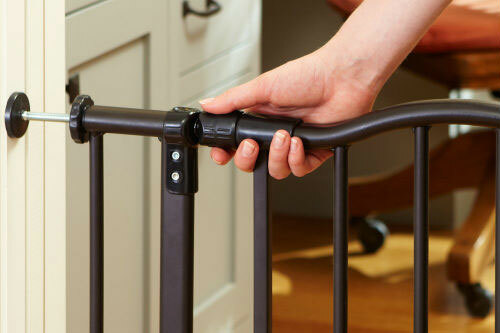 When getting a pressure mounted baby gate, a cheap wall protector like the one pictured here is a no brainer. It provides cushion and spreads out your gate’s pressure over a wider surface area so as not to cause damage to your paint or walls, even with repeated movement and use. 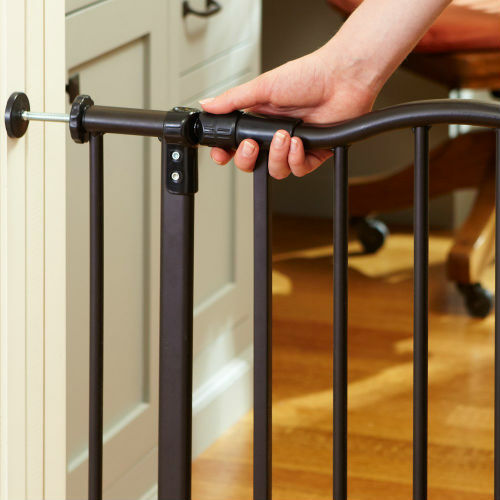 Pressure mounted baby gates typically have 4 adjustable screws or spindles with flat ends that extend to reach your walls or doorframe. You can keep twisting the spindles until there is enough pressure against the wall to hold your gate tightly in place. If that sounds like it could damage your wall as well, it’s because it can! And that’s what we were trying to avoid in the first place! 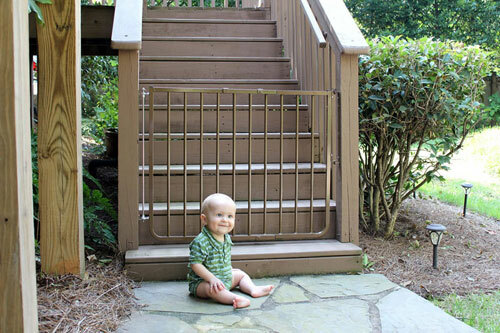 Purchase a baby gate wall protector, which serves to spread out the pressure put against your wall over a wider surface area, as well as cushions the contact point against the wall to protect it while still keeping the gate sturdy. When you need to relocate or remove the gate, there should be no damage to the wall! 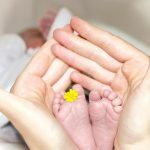 Now that you know a great technique to avoid damage to your wall, let’s take a look at some of the best pressure mounted baby gates with their dimensions and ratings to help you get a sense of which one may be best for your home. Hopefully the table above was useful in getting a sense of your options for a pressure mounted baby gates. As you probably noticed, pressure mounted gates are not as widely available in the extra-wide sizes that some hardware mounted gates are. 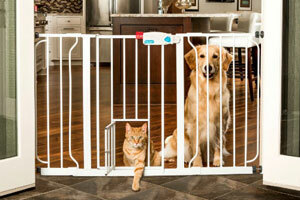 The Regalo Extra Wide gate is an exception to this, as it is pressure mounted up to a width of 58″. The Evenflo Soft and Wide is wide as well at a max-width of 60″, and it is great for some situations but does not feature a door or the more sturdy design of its metal counterparts. 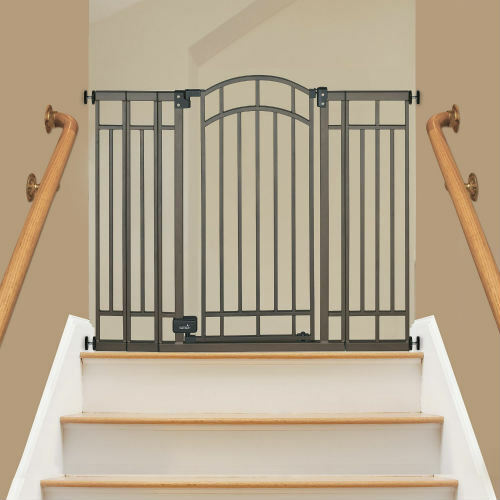 Another very important thing to note is that pressure mounted gates should never be used at the top of stairs. It is just not worth trusting their sturdiness in that more precarious location. 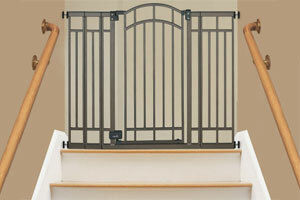 Instead you’ll want one of these baby gates designed for use at the top of staircases. But for the parent who has a relatively standard size opening to gate and who doesn’t want to damage the wall with hardware installation holes, a pressure mounted gate is the way to go. Below we’ll look at some specific models and their advantages and disadvantages. 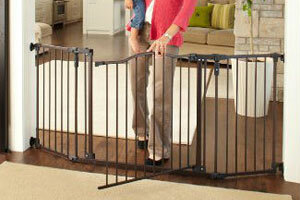 The Supergate Portico Arch Gate by North States again tops the list of highest rated baby gates in its category. An elegant and compact pressure mounted gate, this North States design really wins us over with its matte bronze finish and subtle arched doorway. The Supergate Portico Arch Gate is designed for openings between 28.25″ and 38.25″ and comes with two extension frames that help you get the right fit in your doorway. 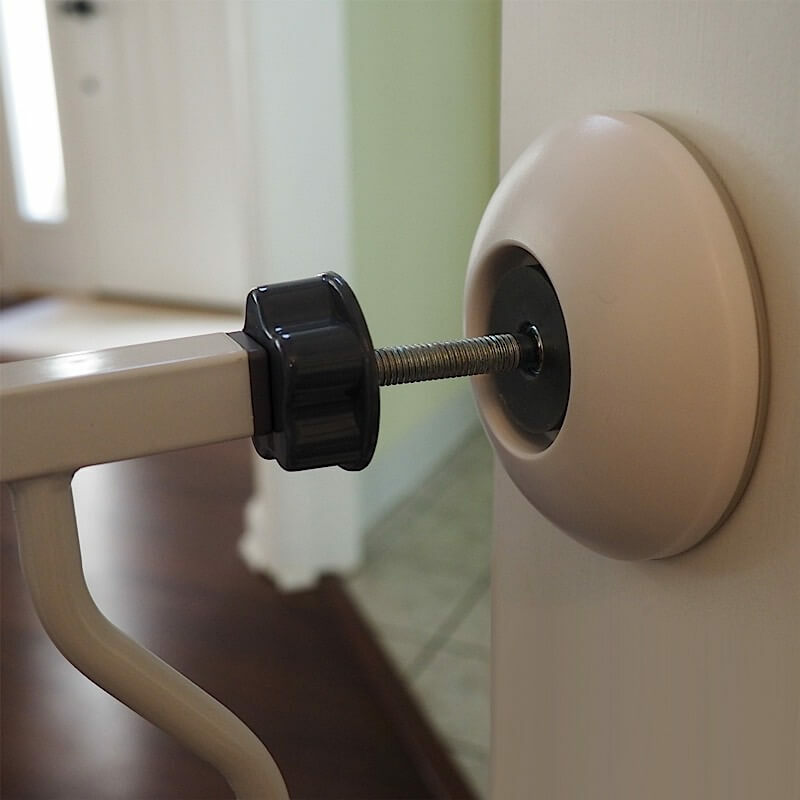 You can use the gate with neither, one, or both of these extensions, and then use the spindle screws to fill the rest of the space and tighten until the pressure against the door frame holds the gate securely in place. 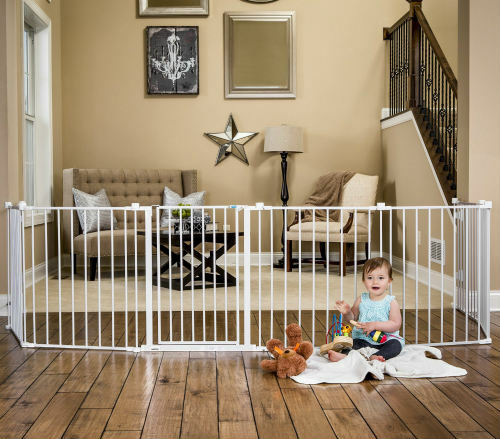 North States baby gates are priced slightly above competitors, but their high quality sturdiness and customer satisfaction often makes that small price difference worth it. 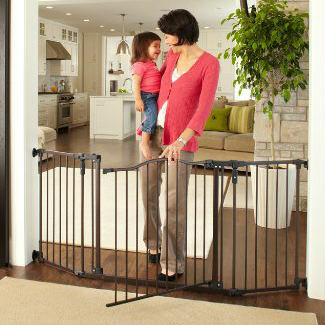 The Summer Infant Multi-Use Deco Walk-Thru Gate is one of the most versatile options in baby gates. 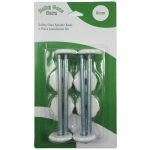 It is pressure mounted, from 28 to 48 inches wide with its included fly-out extensions, and comes in at a very tall 36 inches height. Part of what makes it so versatile as well is that it also comes with optional hardware, in case you’d ever like to move it to a space where a hardware mount would be needed, such as the top of your stairs. 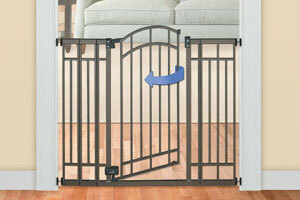 The Summer Infant gate is also certainly one of the most stylish options. It has a very elegant look with a matte bronze finish and an arched doorway. 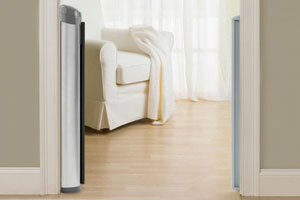 With its ability to be both pressure mounted and hardware mounted, the Summer Infant Multi-Use is great for evolving families whose needs may change over time, or as just a really solid pressure mounted doorway gate for your doorframe. 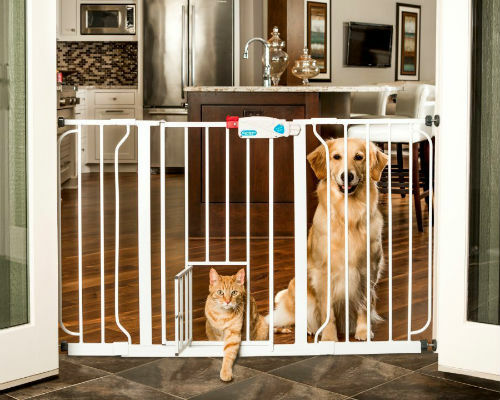 If white is more your style, the North States Supergate Easy Close is one of the best choices for pressure mounted baby gates. It has a heavy duty metal construction while it is rather small and unintimidating at 29″ high. It’s a gate that can blend into the rest of your home a bit more than others. The pressure mount of this gate has received quite favorable reviews from customers. 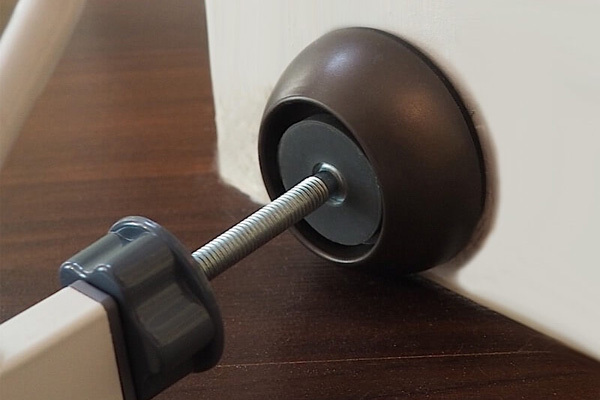 Unlike most others, this model comes with a couple of wall pads or cups that you can stick onto your wall where the pressure knobs will meet them to help protect the wall. One important thing to note is that the door of this gate may not seem fully aligned until you’ve tightened the pressure knobs all the way. Don’t think that it’s broken or faulty, that’s just the design of this model and it works perfectly once you’ve tightened the pressure mounts!